Raw preparations like crudo, carpaccio, poke, ceviche, tataki and sashimi, rely on two key principles: freshness of product and technical skill for perfect presentation. James Beard Award winning chef/owners Hiro Sone and Lissa Doumani of Terra in St. Helena and Ame in San Francisco, each a Michelin starred restaurant, share their expertise on serving raw lobster, abalone, oysters and fish, a celebrated feature at their raw bar at Ame. Chef Sone is a master of technical and visual presentation of all things raw with a refined Japanese sensibility and passion for exceptional dining experiences. When: Monday, October 26, 12 – 2 p.m. In 1988 Hiro Sone and Lissa Doumani opened Terra (“earth” in Italian, “temple” in Japanese), a world-class restaurant in Napa Valley’s historic town of St. Helena. 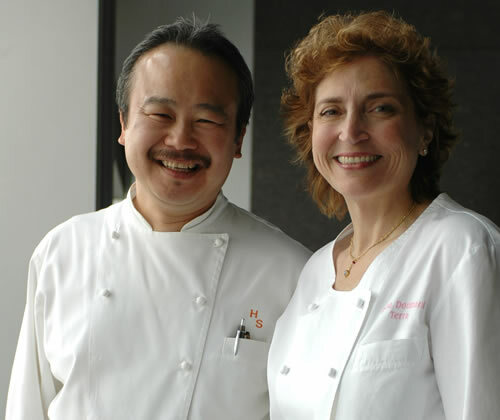 Since then the husband-and-wife team’s intimate restaurant has become a top dining destination showcasing Chef Sone’s seasonal menu that blend local ingredients with the flavors of southern France and northern Italy, his refined Japanese sensibility, and the couple’s history, travels, tastes, and passion for exceptional dining. that is revered at Terra, with San Francisco influences such as a striking sashimi bar with an extensive raw menu. A native of Japan, Sone mastered the art of classical French and Italian cooking at Ecole Technique Hoteliere Tsuji in Osaka. Later he became the chef of Spago Tokyo, then Spago Los Angeles. Lissa Doumani honed her culinary skills in the kitchen of Sally Schmidt, the original owner of French Laundry, at Spago in Los Angeles under Nancy Silverton, and as pastry chef at Roy Yamaguchi’s 385 North in Los Angeles. The couple, whose restaurant Terra received a 2005 James Beard Foundation nomination for “Outstanding Service,” divide their time between St. Helena and San Francisco.